.Professor (Nuclear Physics) at 10-October -2013. ·Assistant Professor (Nuclear Physics) at 18-May-2008. ·Lecturer (Nuclear Physics) at 13-April-2005. ·Assistant Lecturer (Nuclear Physics) at 8-July-2002. .Ph.D. (Nuclear Physics), Baghdad University, Baghdad, IRAQ (2007). ·M.Sc. (Nuclear Physics), Babylon University, Babylon, IRAQ (2001). ·B.Sc. (Physics), Babylon University, Babylon, IRAQ (1998). Head of Physics Department (22/9/2014- present). Associate Dean for Academic Affairs /Evening Study (1/12/2016- present). 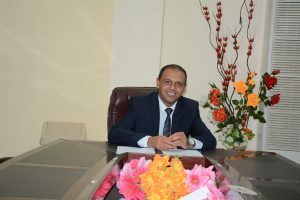 Head of Computer Science Department (18/9/2012- 22/2/2014). Head of Computer Science Department (6/12/2008- 16/10/2011). Head of Physics Department/Evening Study (1/12/2007- 1/7/2009). Trustee of the Council of the Science College (3/7/2007-12/12/2008). Coordinator of Physics Department (3/7/2007-8/4/2008). Editorial Board Member of Boson Journal of Modern Physics (2015). Editorial Board Member of SDRP Journal of Biomedical Engineering (2015). Editorial Board Member of Al-Bahir Journal for Natural and Engineering Sciences (2015). Editorial Board Member of Karbala International Journal of Modern Science (2015). Editorial Board Member of Pinnacle Advanced Physics (2015). Editorial Board Member of WALIA Journal (2014). Editorial Board Member of International Journal of Advanced and Applied Sciences (2014). Editorial Board Member of Brazilian Online Journal (2014). Editorial Board Member of Caspian Journal of Applied Sciences Research (2014). Editorial Board Member of Journal of Natural Sciences (2013). Editorial Board Member of International Journal of Scientific Research in Knowledge (2013). Data in Brief (DIB)/ ISI. Indian Journal of Physics (INJP)/ ISI. European Physical Journal A (EPJA)/ ISI. Caspian Journal of Applied Sciences Research (CJASR)/ ISI. Canadian Journal of Physics (CJP)/ ISI. Ukrainian Journal of Physics (UJP)/ ISI. International Journal of Physical Sciences (IJPS). Al-Bahir Journal for Natural and Engineering Sciences (BJNES). Journal of Scientific Research and Reports (JSRR). Physical Science International Journal (PSIJ). British Journal of Applied Science & Technology (BJAST). World Journal of Engineering and Physical Sciences (WJEPS). Scientific Research and Essays (SRE). Asian Journal of Applied Sciences (AJAS). International Journal of Scientific Research in Knowledge (IJSRK). Journal of Applied Mathematics and Physics (JAMP). Physical Review & Research International (PRRI). International Journal for Sciences and Technology (IJST). Journal of Babylon University (JBU). Journal of Kerbala University/ Scientific (JKUS). Iraqi Journal of Science (IJS). Al-Qadisiya Journal for Engineering Sciences (QJES). Physics, College of Science, University of Baghdad, Baghdad, Iraq (2007). University of Babylon, Babylon, Iraq (1998).
. Modern Physics/ Second Stage.
. Computer Science/ First Stage- Department of Chemistry. · Biological Physics/First Stage- Department of Biology. · Logic Circuits Lab./ First Stage- Department of Computer Science. · Electricity and Magnetism Lab./ First Stage. · Classical Mechanics Lab./ First Stage. · Quantum Mechanics/ Third Stage. · Nuclear Lab./ Fourth Stage. · Mathematical modeling and computer simulations/ Third Stage. · Mathematical modeling and computer simulations Lab./ Third Stage.
. Advance Electromagnetic Theory /First Semester. · Computational Physics Lab./Second Semester. · Interacting Boson-Fermion Model (Special Topics)/ Second Semester. · Interacting Boson Model (Special Topics)/ Second Semester. 1. Wesam N. Hussain, MSc thesis, Description of the Low-Lying states Properties for the Even-Even 78, 80Se and80, 82Kr Isotopes Using IBM, Department of Physics, College of Science, University of Kerbala, Karbala, Iraq, 2017. 2. Mariam O. Waheed, MSc thesis, Microscopic description of the deformation properties for some Pd isotopes using IBM and IBFM, Department of Physics, College of Science, University of Kerbala, Karbala, Iraq, 2017. 3. Hussein Hamad Khudhur, MSc thesis, Positive Parity States and Some Electromagnetic Transition Properties of 120-127 Xenon Isotopes, Department of Physics, Faculty of Education for Girls, University of Kufa, Al-Najif, Iraq, 2016. 4. Kahtan Adnan Hussain, MSc thesis, Negative Parity States and Some Electromagnetic Transition Properties of Even-Odd Mercury Isotopes, Department of Physics, College of Science, University of Babylon, Babylon, Iraq, 2015. 5. Anwer Ahmed, PhD thesis, Nuclear Shell Structure of Odd-A Magnesium Isotopes Within USDA Hamiltonian, Department of Physics, Faculty of Science, University of Malaya, Kuala Lumpur, Malaysia,2015. Fatima Mohammed Hussain, Semiclassical Approach for Nuclear Fusion Reactions of Some Medium and Heavy Nuclei, Al-Mustansiriyah University, IRAQ, 2017. Raghad Imad Mahmood, The Effect of Short Range and Tensor Correlations on the Electron Scattering From 19F, 27Al and 29Si Nuclei, Baghdad University, IRAQ, 2017. Abdullah S. Mdekil Al-Wassity, Jastrow Short range Correlation Effect on the Densities and Electron Scattering Form Factors of Some Nuclei, Baghdad University, IRAQ, 2016. Eman Musa Rasheed, Shell Model and Hartree-Fock Calculation of Static and Dynamic Properties for Some Nuclei, Baghdad University, IRAQ, 2016. Sheimaa Thiab Aluboodi, Microscopic Study of Nuclear Structure for Some Nuclei Using Skyrme-Hartree-Fock Method, Baghdad University, IRAQ, 2014. Nabeel F. Lattoofi, Calculation of the Nuclear Densities and Form Factors Using Skyrme-Hartree-Fock Method, Baghdad University, IRAQ, 2014. Akram Mohammed Ali Kreachi, Cross Section Calculations for (N,a) Reactions of Some Nuclei, Baghdad University, IRAQ, 2014. Wasan Zuheir Majeed, Matter Density Distribution and Electron Scattering Form Factors of Exotic Nuclei, Baghdad University, IRAQ, 2013. Mohanad Hussein Oleiwi, Longitudinal Form Factors Calculations for Some Low Mass fp-shell Nuclei with Core-Polarization Effects, Baghdad University, IRAQ, 2013. Rawaa Amer Hamid, Study of the Natural Radioactivity of Selected Models from the Soil of the Official Circuits in the City of Al-Qasim using the Gamma Ray Spectrometer, Kufa University, IRAQ, 2017. Mohanad Hasan Meteab, Semiclassical and Quantum Approaches of Nuclear Fusion Reactions for Some Medium Nuclei. Babylon University, IRAQ, 2017. Aqeel Adil Hasan, Measurement of radionuclides (Radon, Uranium and Radium) concentrations and hazard indices for water and sediments of Euphrates River, tap water and wells water for Karbala Governorate- Iraq, Al-Mustansiriyah University, IRAQ, 2017. Ghazwan Abdulelah Al-Edhari, A Theoretical Study to Calculate the Energy of Four Atomic Systems, Kufa University, IRAQ, 2017. Hassan Ali Freeh, Theoretical Study of Photons Yield Production at the Quark-Gluon Interaction for Compton Processes, Wasit University, IRAQ, 2017. Rasool Mohammed Kareem, Calculation of Energy Levels and B(E2) for Some f7/2 Shell Nuclei Using Different Interactions, Kufa University, IRAQ, 2016. Gulyuzturaeva, A Study on Energy Properties of Low Excited States of Deformed Nuclei in Rare-Earth Region, International Islamic University Malaysia, MALAYSIA, 2016. Wefaa Salim Sugab, Calculation of Gamma-Rays Quantities Produced from Nuclear Fission in Burn-Up Nuclear Fuel in Electricity Nuclear Power Plant PWR, Kufa University, IRAQ, 2015. Sajjad Ali Ameen, The study of Radioactivity in Soil Samples From Al-Haidriya City in Al-Najaf Al-Ashraf Governorate, Kufa University, IRAQ, 2014. Ahmed Adnan Hamza, Nuclear Structure Study of Some fp-Shell Nuclei, Baghdad University, IRAQ, 2014. Zahraa Majid Abdul-Hamza, Study of Electron Scattering Form Factors For fp-Shell Nuclei Using Nuclear Shell Model, Babylon University, IRAQ, 2014. Noor Hadi Abbas, The Effect of Coupled-Channels in Collisions Between Heavy Ions Near The Coulonb Barrier, Babylon University, IRAQ, 2014. Hadeel Ali Hussein Al-Jabri, Theoretical Study of Atomic Properties for Three Electron Systems (Z=10-16), Kufa University, IRAQ, 2014. Jaafar Tu’ma Ahmed, Density Functional Theory Calculations for Donor-Bridge-Acceptor Molecular Systems, Babylon University, IRAQ, 2014. Mohammed A. Mohammed, A Study of Some Nuclear Properties of ( Even-Even) Dysprosium (154-164Dy) Isotopes Using The First Interacting Boson Model (IBM-1), Babylon University, IRAQ, 2014. Dhia Alwan Abdul Hussain, Electromagnetic Properties of Some P- Shell Nuclei, Baghdad University, IRAQ, 2013. Sami Edan Abid Al- Slami, study of shape Transitions Symmetry for Some Nd Isotopes Using Interacting Boson Model-1, Kufa University, IRAQ, 2013. Amjed Mohammed Shareef Al-Khafaji, Calculation of The Energies of K-Shell for Some Atoms by Using Hartree-Fock Wave Function, Kufa University, IRAQ, 2013. Ramla Abdulnaby Abdulzahra, Density Functional Theory Calculations of Donor-s-Bridge-Acceptor Molecules, Babylon University, IRAQ, 2013. Rua’a Salam Kadhim Al Hassnawy, Close and Distant Collisions Dependent to Calculate Stopping Power for Heavy Charged Particles, Kufa University, IRAQ, 2013. Ruwaidah Tarek Mahdi, Charge Density Distributions and Elastic Electron Scattering Form Factors For Some Nuclei, Baghdad University, IRAQ, 2013. Hawraa Ali Abdul Redha Al- Dabag, Studying the Effect of Bloch Correction on Stopping Power for Heavy Charged Particles, Kufa University, IRAQ, 2012. Thaeir Jabbar Al-Kawwaz, Shell Model Calculations of Some Even-Even in the Vicinity of 100Sn and 132Sn Neutron-Rich Nuclei Using Nushell@MSU, Babylon University, IRAQ, 2012. Ahmed Jassim Mohammed Al- Lamy, Inelastic Longitudinal C6 Form Factors in Ti50 as a Detection Probe to Study the Effects of M3Y Terms, Baghdad University, IRAQ, 2012. Amir Yasser Kazem, A study of Nuclear Properties of 148-154Sm Even- Even Isotopes By the Interacting Boson Model-1[IBM-1], Babylon University, IRAQ, 2010. Haider Abbas Marhoon, A Study of properties of Energy levels for Isotopes 98-104Mo by Using Interacting Boson Model-1 [IBM-1], Babylon University, IRAQ, 2010. Mohammed Abdul Kadiam Al-Sadi, Study of the Background Radiation in Selected Areas of the Governorates of Iraq, Babylon University, IRAQ, 2010. 6. Mushtaq Abed Al-Jubbori, Khalaf Ajaj Al-Mtiuty, Khaliel. I. Saeed and Fadhil I. Sharrad, Properties of even 168-178Hf isotopes using IBM-1 and SEF, Chinese Physics C, 41 (2017) 084103 https://doi.org/10.1088/1674-1137/41/8/084103. new method (SEF), Nuclear Physics A, Vol. 955 (2016) 101-115.
boson model-1, ScienceAsia, Vol.42 (2016) 22–27. Armenian Journal of Physics, Vol. 8 (2015) 170-179.
factors of 25Mg, Physical Review C, Vol. 92 (2015) 034327. Physics, Vol. 4 (2015) 14-18. SCIENCE AND TECHNOLOGY, Vol.64 (2015) 38-43. 21.Abdurahim Okhunov, F. I. Sharrad, Anwer A. Al-Sammarea and M. U.
of Even Isotopes of Yb, Chinese Physics C, Vol.39 (2015) 084101. Physics, Vol. 45 (2015) 340-346. Even-Odd 187-197Pt Isotopes, Nuclear Physics A, Vol. 933 (2015) 1-15. Isotopes of Yb, arXiv:[nucl-th] 1408.0072v1 (2014). Journal of Modern Physic E, Vol. 23 (2014) 1450046. Isotopes, Research & Reviews: Journal of Physics, Vol. 3 (2014) 11.
International Journal of Science and Research (IJSR), Vol. 3 (2014) 2189. Physical Journal-Plus, Vol. 129 (2014) 125.
of Some Light Nuclei: (23Na, 25Mg, 27Al, and 41Ca), Physical Review C, Vol. Journal of Natural Sciences, Vol. 1, Issue 2,(2013)37-43. Journal of Physics,Vol. 2, Issue 2,(2013)1-4. 36.F. I. Sharrad, Hewa Y. Abdullah, N. Al-Dahan, N. M. Umran, A. A.
Chinese Physics C, Vol.37, No.3 (2013) 034101. Journal of Physics, Vol.58, No.1-2 (2013)99-105. 38.F. I. Sharrad, A. K. HAMOUDI, R. A. Radhi, Hewa Y Abdullah, A. A. Nuclei, Chinese Journal of Physics, Vol.51,No.3 (2013)444-457. Foundation of Sri Lanka, Vol.41,No.3 (2013)202-217. 41.F. I. Sharrad, H.Y. Abdullah, N. Al-Dahan, A. A. Mohammed-Ali, A. A. 43.F. I. Sharrad, H. Y. Abdullah, N. Al-Dahan, A. A. Okhunov and H. A.
Isotopes of Sm, Armenian Journal of Physics,Vol.5, No.3(2012) 111-121. University, Vol.8, No.4 Scientific(2010) 342-352. Electron Scattering Form Factors For Some 2s-1d Shell Nuclei, J. of AlNahrain University, Vol. 13, No.4 (2010) 88-98. Nuclei, J. of Wassit for Science and Medicine, Vol.2, No.1 (2009) 42-55. J. of Kerbala University, Vol.7, No.2 Scientific(2009) 117-130.
and Photo peak Relativity Efficiency for the NaI (Tl) Detectors, J. of AlAnbar University for pure science, Vol. 2, No.2 (2008) 46-49. J. of Kerbala University, Vol.6, No.1 Scientific(2008) 67-77. 53.N. M. Umran, M. A. Al-Kaabe, Fadhil I. Sharrad, N. Al-Dahan and F. K.
University, Vol.5, No.1 Scientific (2007) 106-117, Arabic. Isotopes, J. of Babylon University, Vol.14, No. 1(2007) 62-69. 55.Fadhil I. Sharrad, N. Al-Dahan, F. K. Mohammed, N. J. Redha and N. S.
Kerbala University, Vol.5, No.3 Scientific (2007) 40-58, Arabic. No.11 Scientific (2005) 1-11, Arabic. University, Vol.2, No.10 Scientific (2005)13-18. Conference: ICOWOBAS2017: 6thInternational Conference and Workshop on Basic and Applied Sciences, March 18 – 19, 2017 at Salahaddin University, Erbil, Kurdistan, Iraq. The Fifth Scientific Conference of College Science of Kerbala University, 22-23 Feb 2017, Karbala, Iraq. Conference: ICRAPID 2017: 19th International Conference on Recent Advances in Physics for Interdisciplinary Developments, January 26 – 27, 2017 at Sydney, Australia. The Fourth International Scientific Conference of College Science of Kerbala University, 24-25 Feb 2016, Karbala, Iraq. Training to Coordinate Academic Efforts on Chemical Security, Biosecurity and Radiological/ Nuclear Security Workshop, 23-24 Dec. 2015, Babylon University, Iraq. The Third International Scientific Conference of College Science of Kerbala University, 25-26 Feb 2015, Karbala, Iraq. The Second Scientific Conference of College Science of Kerbala University, 26-27 Feb 2014, Karbala, Iraq. National Conference on Physics 2012(PERFIK 2012), Colmar Tropical, Bukit Tinggi, Pahang, 19-21 November 2012, Malaysia. Synchrotron Workshop by NSRRC and University of Malaya, 14-15 Dec 2011, Kuala Lumpur, Malaysia. The Sixth Symposium for Kerbala University 1-2 May 2010, Iraq. The Symposium for Physics Department, Science College- Babylon University 8 December-2009, Iraq. National Symposium for the prevention of radioactive contamination, the Council of Ministers, the advisers, Baghdad 4 – October 2009, Iraq. The Symposium for Mathematics and Computer Science College – Al-Qadisiyah University 22 July-2009, Iraq. The Fourth Symposium for Kerbala University 11-12 April 2009, Iraq. The First Symposium for Physics Department, Science College- Baghdad University 2009, Iraq. The First Symposium for Science College- Al-Qadisiyah University 26-27 March 2008, Iraq. The Fourth Symposium on use of Nuclear Techniques in Environmental Studies 13-15 – September 2004 Yarmouk University-Irbid-Jordan. The First Scientific Symposium on Post Graduate Studies in Physics Department, 6 February -2003 Babylon University, Iraq. The Third Scientific Symposium on Environmental Pollution in Babylon City, 25 July – 2002, College of Science, Babylon University, Iraq. The Second Scientific Symposium on Environmental Pollution in Babylon City, 13 – March – 2001, College of Science, Babylon University, Iraq. The Fourth Symposium in the Magnetism 6-8November 2000 Yarmouk University – Irbid- Jordan.